The VW Alltrack and SportWagen are finally here. On Thursday, November 10 we are celebrating these all new wagons. You are invited! 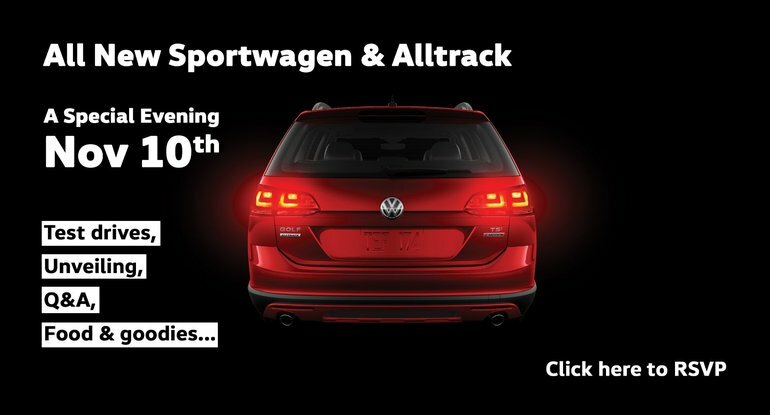 The new VW SportWagen in all its trim levels and the incredible new VW Alltrack will be available for test drives. Our team will be here to answer all your questions about the 4MOTION AWD system. You will receive a $50 DasCard. Anyone who orders a new VW Alltrack or VW SportWagen that evening will receive a factory roof rack free of charge! We’re pretty excited about this event. We hope you are too. Please RSVP by Thursday, November 3rd here. We just received the very first 2017 VW Alltrack and SportWagen, and as we suspected, they look awesome. Volkswagen’s 4MOTION all-wheel-drive system is finally available on the Golf SportWagen for all trims and for the VW Alltrack. Hooray! 4MOTION AWD helps ensure optimum traction on most surfaces even in adverse weather conditions. People who purchase wagons usually have “versatility” high up on their list of automotive priorities. By adding AWD to the already-versatile VW SportWagen, the versatility is veritably off the charts. Roads that used to be off-limits to a wagon are now green-lit! This is great news for anyone who needs the utility of a compact sport utility vehicle, but craves the cornering ability of a sports sedan.